Julia Morgan’s personal archives belie one of the most persistent myths about her: that she destroyed the records of her nearly fifty-year practice when she retired in 1951. In fact, Morgan carefully preserved thousands of architectural plans, drawings, sketchbooks, photographs, correspondence, project files and other papers that tell the story of her life and career. Her vast archive, which was given to California Polytechnic State University by her heirs in 1980, is held in the public trust in Kennedy Library’s Special Collections. It sheds light on a life of skill and style and illustrates her influence on California architecture and the built environment. The exhibit, which is designed to travel to other libraries and galleries, presents visual representations of Morgan’s craft and design aesthetic. It will be shown alongside Cal Poly architecture student work inspired by her design principles. Featured in the exhibit will be reproductions of Morgan’s student work at the École de Beaux-Arts in Paris, William Randolph Hearst commissions, civic work with YWCAs and residential commissions. It will also showcase her beautiful work in gouache and pastel on paper. The Atelier Morgan exhibition is presented in collaboration with the Julia Morgan 2012 Festival that runs October 1, 2012 – November 16, 2012. 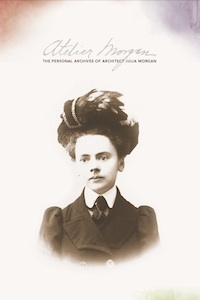 The Julia Morgan 2012 Festival is a statewide event that explores the life and work of Julia Morgan, California’s first licensed female architect; the first female to graduate from the École des Beaux-Arts in Paris; and the architect of over 700 structures in California alone. The exhibit is open during regular library hours starting November 9, 2012 until January 11, 2013. Yes! Thursday! It's 3:23pm right now.